The Sangoma A40603D is part of the Sangoma A400 series. 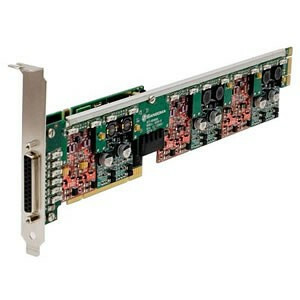 The Sangoma A400 series is the high density version of the popular A200 series analog cards. Identical in operation and configuration, and using the same FXO and FXS modules, the A400 system supports twelve ports per main board and Remora™ daughtercard, as compared to four ports for the A200.The A400 and Remora System Support up to 24 FXO/FXS ports. As you need them, additional Remora cards can be added to the Sangoma A40603D card. A single PCI or PCI Express slot host connection can support up to 24 FXO/FXS ports with common synchronous clocking for all channels. Like all the Sangoma AFT Series, the A40603D and Remora system has field upgradeable firmware to take advantage of enhancements as they become available.